I have posted a few craft ideas lately using Mod Podge - but Mod Podge isn't cheap! Now I am going to save you even more money by telling you how to make your own! If you use regular Elmer's Glue-All, it will be waterproof when your project is dry. The other bonus to making your own Mod Podge there is no smell! 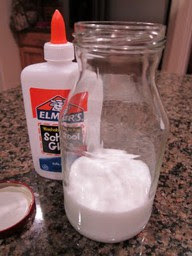 Simply mix 50% Elmer's glue (white glue) and 50% water in a jar. Shake well. And you are done! NOTE: Some use less water - 2/3 glue and 1/3 water. You will have to experiment with small batches to see what works best for you. TIP: If you use markers to make your picture, label, etc. - spray first with hairspray, let it dry then use your homemade Mod Podge. TIP: Add 2 TBSP of varnish for a glossy finish. TIP: If you wanted Glitter Mod Podge, just add some glitter to your homemade mixture! Regina Greene-Pinckert posted: Thanks, now I have a use for the jar I emptied out last night at dinner time! I love upcycling! Sounds like a good idea to use it for things like kids crafts that will end up being thrown away or whatever and not sentimental heirlooms or something hehe. My 18 month old would just eat it though! Regina Greene-Pinckert posted: Thanks for that informative post Amber. I will definitely keep that in mind. I think I want to make my own more for my kids to do projects I know will end up in the trash before too long. But for serious projects, I will definitely buy the real stuff!